We have written a series of posts about phonological awareness. This is the ability to hear and tell the difference between sounds both in isolation and in words. You can read our other posts about listening to sounds, rhyme and syllables. Once a child can tell the difference between two sounds consistently, you can move on to listening for sounds in words. 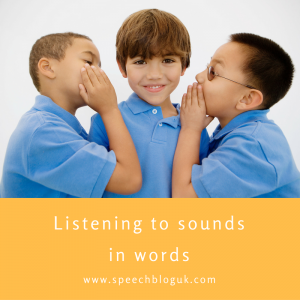 Do make sure you have gone through Helen’s post about listening for speech sounds first before moving onto words. This is a harder skill and normally starts to develop between the ages of four and five years old. So don’t worry if your pre-schooler finds it tricky. Being able to work out what sounds are in a word, needs the child to be able to segment or pull apart the sounds in a word. For example they need to work out that car has a ‘k’ and an ‘ar’ sound it in. When children first learn a word, they remember it as a chunk and have to work out that it is actually made up of different sounds. This skill is key for spelling words and the opposite of blending sounds together that is needed for reading. I work with a number of children at junior school (7-11 year olds) who are finding these skills hard. There is an obvious and often significant impact on their literacy sills. These children will need extra support and practise to gain confidence in these skills. Below is an outline of how to teach this skill. If you are going to work on this please make it fun! Play games, take turns and mix in words your child finds easy as well as the ones they find hard. Also with all the ideas below, we are saying the words and sounds. We are not linking them to the written letter yet as this makes the task harder. How can we help a child work out what the first sound in a word is? One of the main ways we can help a child work out what sounds are in a word, is by saying the word slowly for them. You will need to introduce the idea and say we are going to listen to first sound/ the sound at the start of the word. Then you can say a word slowly for them e.g. sssssssea. If they can’t identify the ‘s’ sound, say the word again and then comment, I can hear that snaky ‘s’ sound, listen ssssssea. If your child is finding it hard to identify the first sounds in words, try using words with long sounds at the beginning as it is easier to elongate them. Think of words that start with s, f or sh. Then once your child understands what we are asking them to do, move onto other sounds at the start of words. It can also help if you start with shorter words. If you give your child a long word they may well identify some of the other sounds instead. Once your child understands the task you could try some variations. Try saying 2 words to your child or show them 2 pictures. For example fish and fox. Then you can ask them if the words start with the same sound. At first you may need to talk about each word and say it slowly so they can identify the sound. Then you can compare the sounds and decide if they are the same. You could show the child two pictures e.g. the sea and a cup. You can ask them to find them the one that starts with a ‘s’. At first you may need to say the words out loud for you child and talk to them about the first sounds before they can identify which pictures starts with a specific sound. There is a great app by I can do apps called Starting Sounds. This has a number of levels to work through and great pictures to support the child. Some children find it tricky to identify the first sound in a word, but may well be able to identify the final sound in words. If you have worked on the first sound for a while and your child is finding it tricky, you could try sounds at the end. Again we want to slow down the word and start with short words. Words with long sounds at the end may well be easier. For example mouse, dice, leaf. Remember to elongate that last sound to help your child hear it.